(Al Hartmann | Tribune file photo) Sandstone walls tower over a beaver dam in Calf Creek. The area is currently part of Grand Staircase-Escalante National Monument. The window opened Friday for oil, gas, uranium and coal companies to make requests or stake claims to lands that were cut from two sprawling Utah national monuments by President Trump in December — but there doesn’t appear to be a rush to seize the opportunities. For anyone interested in the uranium on the lands stripped from the Bears Ears National Monument, all they need to do is stake a few corner posts in the ground, pay a $212 initial fee and send paperwork to the federal government under a law first created in 1872 that harkens back to the days of the Wild West. They can then keep rights to the hard minerals, including gold and silver, as long as they pay an annual fee of $155. It was unclear if anyone was doing that Friday. The Bureau of Land Management declined repeated requests for information about how they’re handling the lands and how many requests and claims came in. The agency says it must comply with a complex web of other laws and management plans. Steve Bloch, legal director of the Southern Utah Wilderness Alliance, said he was told by the BLM Friday afternoon that inquiries were made but no claims sent in. He said other conservation groups that have sued to block the downsized monument boundaries are watching closely to ensure no lands are disturbed in the short-term, hoping a judge will side with them and return the monuments to the original boundaries. Two of the largest uranium companies in the U.S. — Ur-Energy Inc. and Energy Fuels Resources Inc. — said they have no plans to mine there. The price of uranium, which has fallen to about $22 per pound — down from more than $100 in the mid-2000s — would “discourage any investment in new claims,” said Luke Popovich, a spokesman for the National Mining Association. Colorado-based Energy Fuels asked for a reduction of Bears Ears last year in a public comment, but spokesman Curtis Moore said in a statement that the company has higher priorities elsewhere. He noted the lands were open to claims for 150 years prior to President Barack Obama creating the national monument in 2016. “There probably isn’t any land available for staking that would be of much interest to anyone,” Moore said. In Grand Staircase-Escalante National Monument — part of a major coal reserve that a company was preparing to mine before President Bill Clinton protected the lands in 1996 — has been made available again but it appears unlikely any company will immediately jump at the chance this time. Out-of-state demand for Utah’s coal had led to a drop in coal production to about 14 million tons in 2017, down from about 27 million tons in the mid-2000s, said Michael Vanden Berg, energy and mineral program manager at the Utah Geological Survey. “If a new mine were to open, it would be competing with existing mines in Utah for limited demand,” Vanden Berg said. Popovich called it “doubtful given market conditions and other factors” that companies interested in coal would put in a lease request. Vanden Berg noted that a potential coal port in Oakland, California, could open up an Asian market and that technology could be developed to change market forces. There’s some potential for oil and gas at Grand Staircase, Vanden Berg said. But Kathleen Sgamma, president of an oil and gas industry group called Western Energy Alliance, said heavy oil shale in the area would require an intensive mining operation that doesn’t make sense in today’s market. “There’s no fracking trucks at the border waiting to rush in,” Sgamma said. President Trump downsized the Bears Ears National Monument by about 85 percent and Grand Staircase-Escalante National Monument by nearly half. It earned him cheers from Republican leaders in Utah who lobbied him to undo protections by Democratic presidents that they considered overly broad. Bears Ears, created nearly a year ago, will be reduced to 315 square miles (815.85 sq. kilometers). 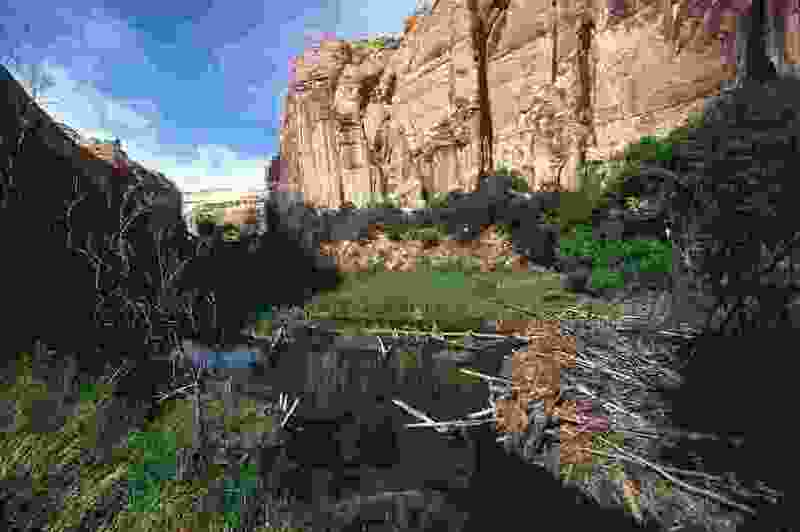 Grand Staircase-Escalante will be reduced from nearly 3,000 square miles (7770 sq. kilometers) to 1,569 square miles (4063.71 sq. kilometers).